Should you have your air conditioning system checked? 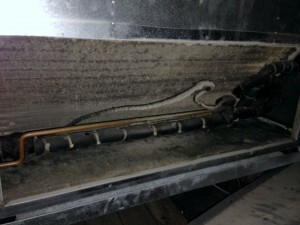 I often get asked how important it is to have a central air conditioning system cleaned and checked regularly, and is it really needed, so I thought I would share a story from earlier this week. The weather can’t seem to make up it’s mind right now, but the hot weather will be here soon enough. In the meantime, we’ve started our annual ritual of pre-season air conditioning tune-ups and safety checks. Earlier in the week, our technician Jeremy Clemens was in Erdenheim Pa to do a tune-up for a customer that had a Unico Small Duct Central Air Conditioning system installed by ECI Comfort several years ago. The homeowner routinely gets his heater cleaned and serviced, but hasn’t had the central air looked at since we’ve installed it. This is what Jeremy found when he started taking the system apart. Mechanical equipment requires many working parts in order to function properly. 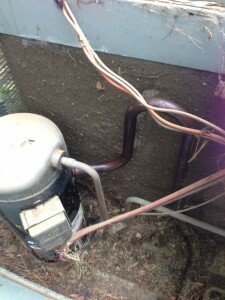 With an air conditioner, nothing (did I say nothing) is more important than the free flow of air across the system and especially the coils, in order to transfer the heat in the air to the coil and it’s refrigerant and then take that heat outside and release it from the refrigerant in the coils to the outside air. You don’t have to have a degree in thermo-dynamics to see that this build up on the coils will substantially reduce the efficiency of the airflow and ultimately the transfer of energy. I doubt that this system would work as is, but imagine how much energy would be wasted by this system having to work twice as long to remove the heat from the air. 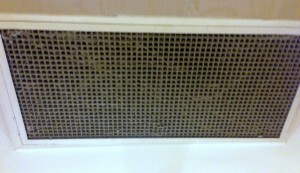 ECI’s number one cause of emergency service calls during heat waves are clogged filters and dirty coils. In extreme cases like this one, the system could even suffer damage to the components that could be quite costly. So I recommend getting a preseason tune up and safety inspection yearly and change your filters often! Call me at ECI Comfort 215-245-3200 or click here to schedule your tune-up now. If you cannot get a tune up, make sure you replace the air filter regularly and pay attention to any strange noises or smells.